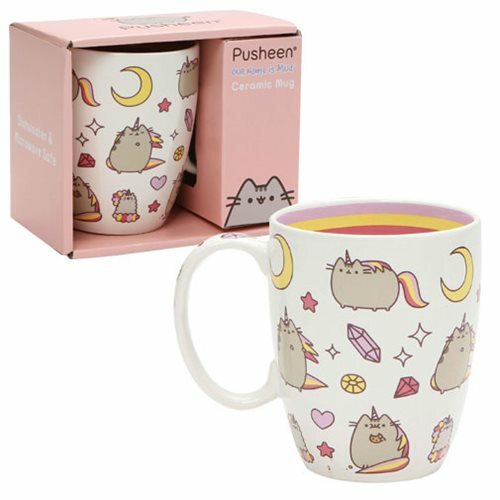 Fans of Pusheen can now enjoy a delicious hot beverage with their favorite cat! This durable 12 oz. stoneware mug features a magical Pusheenicorn and her sister Stormy surrounded by mystical items, like crystals and stars. The Pusheen the Cat Magical 12 oz. Mug comes packaged in a decorative giftbox! Dishwasher and Microwave safe. Measures about 4 3/4-inches long x 4-inches tall x 3 3/4-inches wide.